"We're going to show them that we are not a joke." Are you ready?! 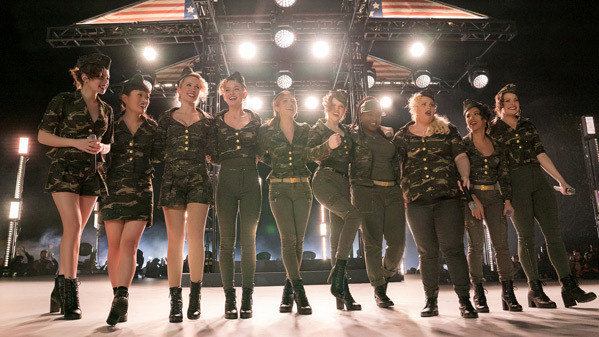 Universal has released a second official trailer for Pitch Perfect 3, the grand finale sequel in the popular ensemble acappella series. This time the Bellas embark on an overseas USO tour and get into more trouble as they try to figure out how to be friends again. Anna Kendrick, Rebel Wilson, Hailee Steinfeld, Brittany Snow, Anna Camp, Hana Mae Lee, Ester Dean, Alexis Knapp, Chrissie Fit, Kelley Jakle, Shelley Regner, Elizabeth Banks and John Michael Higgins all return and are joined by additions including John Lithgow and Ruby Rose. This second trailer is a bit better than the first one, which was all about the goofy comedy, this is more about the family. However, the whole USO tour story still seems a bit forced to me. Hopefully it is still a fun film. You can also still watch the first official trailer for Pitch Perfect 3 here, to see even more footage. Now graduated from college and out in the real world where it takes more than a cappella to get by, the Bellas return in Pitch Perfect 3. After the highs of winning the World Championships, the Bellas find themselves split apart and discovering there aren't job prospects for making music with your mouth. But when they get the chance to reunite for an overseas USO tour, this group of awesome nerds will come together to make some music, and some questionable decisions, one last time. Pitch Perfect 3 is directed by filmmaker Trish Sie, of the film Step Up All In previously, as well as numerous shorts and music videos. The screenplay is written by Kay Cannon (Pitch Perfect 1 & 2, "30 Rock", "Girlboss"). Universal will release Pitch Perfect 3 in theaters everywhere starting December 22nd during the holidays. Who's excited for it?